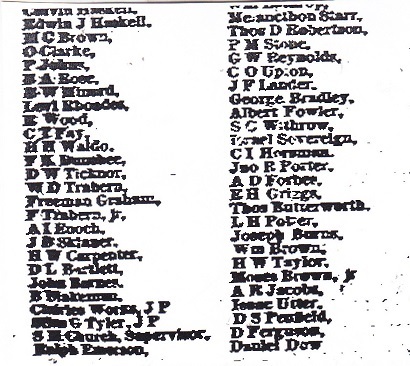 Purchased by Tebala Shrine after Barnes’ death converted to apartments. W.F. and John Barnes Co. The business was first established in 1871, and the present corporation formed in 1884. The officers are W. Fletcher Barnes, President; B. Frank Barnes, Vice-President; and John Barnes, Secretary and Treasurer. 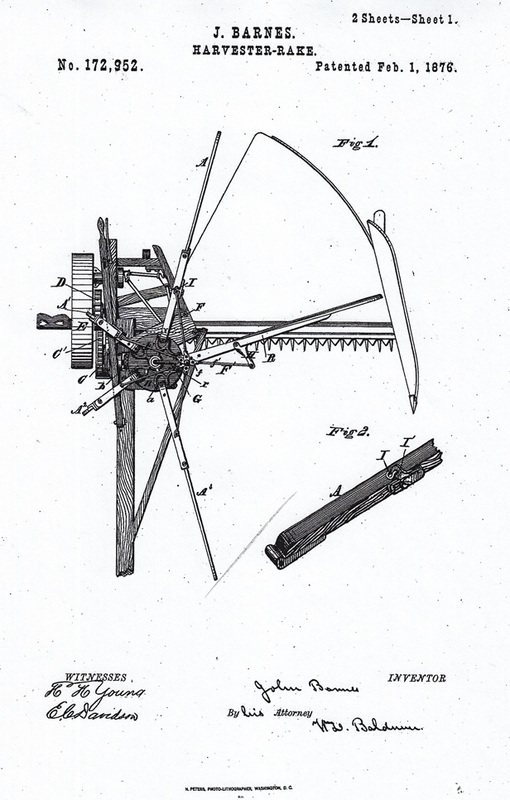 Their buildings are located at the corner of Water and Oak Streets, in East Rockford, and the company manufacture foot, hand, steam power machinery for wood and iron working; lathes, drills, saws, emery grinders, and varies specialties. They have and average of 175 employes on their pay roll. Their main building is of brick, four stories high. The company occupy a total of nearly an acre of floor area. Source: “Industrial and Picturesque Rockford,” Eugene Browne and F. Ford Rowe, 1891. Addresses, Business, General, Manufacturer	B. Frank Barnes, corner of Water and Oak Sts., emergy grinders, est 1871, John Barnes, lathes drills saws, manufacture hand foot and steam power machinery, W. Fletcher Barnes, W.F. and John Barnes Co. 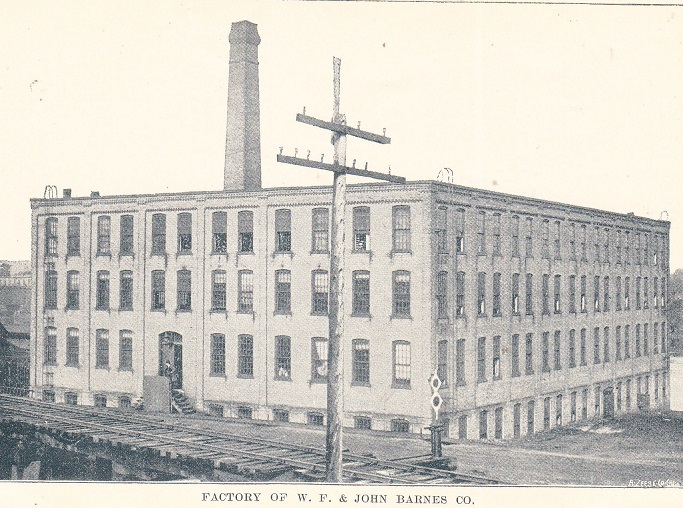 Addresses, Business, General, Manufacturer	391-309 S. Water St., B. Frank Barnes, foot and steam power, John Barnes, Manufacturers, W. F. Barnes, W.F. 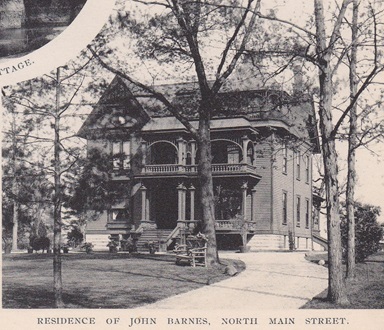 & John Barnes Co.
Residence of John Barnes, 721 No. Main St., 1894 Rockford City Directory, photograph from “1902 Rockford Illinois” by Wheat, page 79. The house was purchased in the 1890’s and rebuilt by Barnes, sec’y and treas. of W.F. 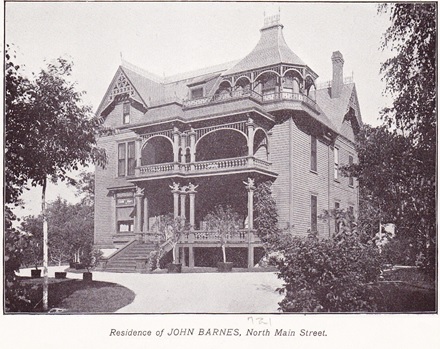 and John Barnes Co., Source: 1894 – 1914 Rockford City Directories. i.e. North Main St. Sears.